All Linux distributions have their own home base: their homepage. How well is this homepage taken care of and how well does it perform? To answer these questions we have monitored the uptime and load time of the homepages for 16 Linux distributions for a month. And since it is a question we can’t resist asking: how do they compare to the homepages of corporate OS giants like Microsoft and Apple? We included those in this survey so that we could answer that question as well. It should be taken into account that these websites have different kinds of resources behind them. Many are run by enthusiasts with a minimum of resources, while others have corporate backing. Keep this in mind while reviewing the data. The intent of this survey is simply meant to show the current situation, not point any fingers. And of course, Microsoft.com and Apple.com for comparison. Although the ideal uptime is 100%, very few websites can actually manage zero downtime in the long term since there are so many things that can go wrong. Webmasters have to deal with network outages, hardware or software problems, pure performance (load) issues, not to mention maintenance. As you can see below, most of the companies and distributions in this survey have done a very good job of keeping their website available to the public. 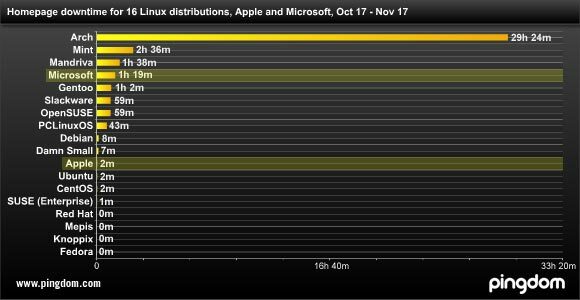 13/16 Linux distributions (and Apple) had less downtime than Microsoft’s homepage. 5/16 Linux distributions had less downtime than Apple’s homepage. Four homepages had NO downtime: Red Hat, Mepis, Knoppix and Fedora. Five homepages had more than an hour of downtime: Gentoo, Mandriva, Mint, Arch and Microsoft. The very long downtime for the Arch Linux homepage was due to an unplanned 29-hour outage that occurred during a weekend. If it weren’t for this incident, their homepage would have fared much better in this survey. Having a website that responds quickly is always important, which is why we also included load time in this survey. When we talk about load time here below, we are referring to the time it takes to establish a connection to the web server and download the HTML part of the page. Images and such are not included. Even though this “HTML load time” will not give the full picture of a website’s performance, it will still be a good indication of how well the website performs and how the web servers and bandwidth are handling the load. 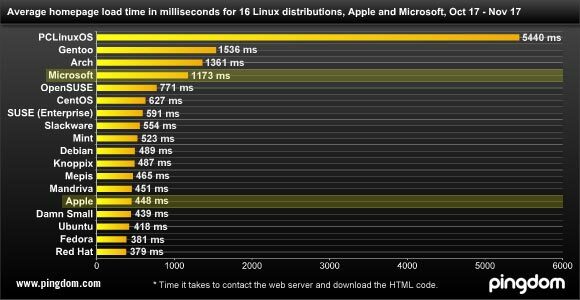 13/16 Linux distributions (and Apple) had a faster average load time than the Microsoft homepage. 4/16 Linux distributions had a faster average load time than the Apple homepage. Nine homepages had an average load time faster than half a second: Red Hat, Fedora, Ubuntu, Damn Small Linux, Apple, Mandriva, Mepis, Knoppix and Debian. Four homepages had an average load time exceeding one second: Arch, Gentoo, PCLinuxOS and Microsoft. When we looked at the monitoring data, we noticed that both Arch, Gentoo and PCLinuxOS had performance issues during this period that were later resolved, something which becomes obvious when looking at the graphs for their average daily HTML load time. When we asked Dan McGee at Arch Linux about this, it turned out that he had tweaked the web server on that date. We have emailed both Gentoo and PCLinuxOS to see if they could shed some light on these performance fluctuations, but have not yet received a reply. It is interesting to see that even with limited resources, many of the teams behind the various Linux distributions are managing a better homepage uptime and load time than Microsoft does, at least during this time period. To Microsoft’s defense, they have one of the most trafficked web pages in the world. On the other hand, so does Apple, and they managed to keep their downtime to a mere 2 minutes. This survey only shows the result for a one-month period, and these results will vary to some degree over time. Therefore we will follow up on this survey in the coming months to see how these websites perform in the long run. This survey was performed with the Pingdom uptime monitoring service, testing the websites from multiple locations in both North America and Europe. For a website to be counted as down it had to either not respond at all, not load within 30 seconds, or return an HTTP error (for example a 500 server error). Errors were confirmed from a second location as well. The load time listed in this survey is the HTML load time, i.e. how long it took to establish a connection with the web server and download the HTML page, not including images or other external resources. As one of the main sysadmins for Gentoo, I’d like to note that you ran into some hardware issues and maintenance that we’ve been doing. The old www cluster isn’t coping anymore, the two machines have uptimes of 528 days and 161 days respectively, and we’re still working on the new cluster. I’d love to see the new numbers for our www after the new cluster is up, as well as for some of the other Gentoo sites (bugs.gentoo.org esp). Contact me and let’s work something out maybe? But all companies and distros use their own material do run their sites? Is that it does not make much sense comparing load time of the homepage and infer that the operating system serving it is good or bad. One other thing to point out is the Microsoft faces more attack attempts than probably all of those web sites combined. I do not remember the exact statistics but it was something to the effect of them getting hack attempts more than whitehouse.gov, fbi.gov and cia.gov combined. While you would think this could be handled by a company with the resources of Microsoft, your stats show the traffic, both good and bad, have a probable affect on their load time. The other piece that should be pointed out is the data that is transferred during load time. Fedora comes in at 12.3KB while MS is a whopping 212.8KB. Redhat is 53.9KB, Ubuntu is 100.4KB and Apple is 107.8KB. I think if you coorelated the load time and the size into KB/ps, you would get a better representation of the performance of the site. I did find it interesting that Fedora is so small, Ubuntu is over 100KB and MS is so bloated (although, that really isn’t that surprising). @Georgesdev and Halfloaded: Of course the web pages will have different sizes. We never claimed that the HTML load time of a page will give you the whole picture. It is just an indication, and from a user perspective it doesn’t really matter what size the web page is. All that matters is how they experience the load time. But yes, if you want to use it as some kind of measurement of server and bandwidth performance regardless of the end result, then the approach that Halfloaded suggested would be interesting. However, we focused on the end result here, regardless of the HTML size (which is something the website owner can actually affect, so in a way it’s part of maintaining the website itself). Hopefully that clarifies how we were thinking, although you both had a valid point. If you don’t mind me using your load time averages, I would like to post a kbps perspective on my site. I would compare my load time averages but I am using a cell card with horrible reception up in the mountains. I’ll make sure and give you credit. This is one of the least valuable articles I’ve ever read. Homepage uptime has absolutely nothing to do with the stability of the OS. On the contrary to what was last said… I think that the uptime of the homepage tells the user alot about the kind of support available for the OS and also how much effort they put into their product. Say you were going to choose a linux distro… Would you go with the company that releases no updates and their site is down 90% of the time (possibly the reason for the lack of updates)? or the one with no (or the least amount of) downtime? Also looking at this from the perspective of the general public. What does the uptime and load time of the website tell people? It could say that this company really doesn’t put in the time and effort to make something worthwhile. Why should I buy something from a company that doesn’t even take the time to keep their website functioning properly? What does their webpage up-time and load time have to do with…Anything? @Colonelcrayon: We never said that this is a reflection of the operating systems. This is a survey about websites, nothing else, and we’re not saying that you should choose your OS based on how its website performs. @Todd: You don’t think it’s relevant to know how a website performs and is managed?